The small but very territorial Desert Pupfish is just like a puppy dog 'nipping the heels' of intruders, as he staunchly defends his home! The Desert Pupfish Cyprinodon macularius is small, reaching about 2 1/2 inches (6.5 cm), but very territorial. When you put two words together like 'desert' and 'fish' you know you must have a highly adaptable animal. The various species of pupfish can tolerate a wide range of temperatures and high salinity. However most species of pupfish are seasonal, living their entire life cycle of only a few short months in a puddle of water that the desert sun will soon dry up. The Desert Pupfish is also from a desert habitat but it is not one of the 'seasonal' species. This is because they don't live in water holes that dry up seasonally, and consequently they can live for upwards of two years. They do live in some stern conditions though. They are naturally occurring in hot springs and water holes where the temperatures can reach as high 113° F (45° C) and have salt concentrations up to six times greater than the ocean, up to a 20% salinity! In the winter when the water becomes cold the Desert Pupfish becomes dormant, burrowing into the muddy bottom of its home. As the warmth of spring approaches and the water temperature rises above 70°F, it again becomes active. Spring is also the beginning of their breeding season, so the males will adopt their luminescent blue breeding colors and aggressively defend their territories. The Desert Pupfish was described by Baird and Girard in 1853 They are found in the lower Colorado River drainage of North America from the southern part of the United States to Northern Mexico; southern parts of California, Arizona, and Nevada and as far south as Sonora, Mexico. They inhabit marshes and lakes as well as springs and water holes. These fish are very old, biologist refer to them as 'living fossils'. It is evidenced that where the pupfish live was once a series of interconnected prehistoric desert lakes. Around 10,000 years ago these Pleistocene lakes began to evaporate. The pupfish became isolated from one another so the genus, Cyprinodon, developed into various species. Today there are 13 known species, and several subspecies. Many are found only in one specific water hole or pond, making them endemic to that locale. These fish can withstand extreme conditions, living in waters with low oxygen, high temperatures over 95° F, and salinity levels over 3 times that of seawater. The Pupfish is being introduced to other regions to be used for mosquito control. In their natural habitat these fish feed on benthos, larvae, detritus, vegetation, and snails. Social Grouping: Solitary - Males can be very territorial. IUCN Red List: NE - Not Evaluated or not listed - The Desert Pupfish is not listed on the IUCN Red List but it is listed as endangered in California since October, 1980 and has been all but eliminated from Arizona. It is listed as endangered at the federal level in the United States, since March, 1986. Endangerment is caused by habitat destruction/fragmentation and the introduction of none native fish species into their environment. The body of the Desert Pupfish is rather pudgy with a short scaled head and upturned mouth. The fins are rounded and the dorsal fin is set towards the back half of the body. Females will reach about 2 1/2 inches (6.5 cm) and males about 3 inches (7.5 cm). The wild form of this fish is not particularly flashy except for the males when in breeding colors. Males become an iridescent blue when in breeding mode. The females, young, and non-breeding males are an olive to tan color with several dark vertical bars on the sides. Size of fish - inches: 3.0 inches (7.62 cm) - Females will normally grow to 2 1/2 inches and males will grow to 3 inches. Lifespan: 2 years - They are sometimes considered to be annual fish as they often die yearly when their environment drys up. The Desert Pupfish survives in a very brutal environment in the wild. Because of this, these fish are very adaptable in the home aquarium. However, these fish do have a short lifespan of only 1 to 2 years. They do best in a brackish environment, so are best suited for fish keepers with some experience. The Desert Pupfish are omnivorous. In the wild Desert Pupfish eats algae, detritus, and aquatic invertebrates. In the aquarium they will eat flakes and frozen food as well as brine shrimp, Tubifex worms, and bloodworms. These fish come from waters that constantly change making it an easy fish to care for. They will require a heater because iIf temperatures fall to below 68° F, these fish will hibernate. With this fish it is smart to actually use 2 heaters incase one breaks for some reason. Provide good filtration and do regular water changes. Weekly water changes will help keep the fish healthy and happy. Do regular weekly water changes of 30%. Water Changes: Weekly - Water change should be about 30% weekly. 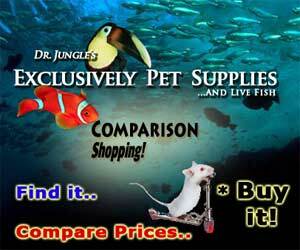 They are an easy fish keep and a 15 or 20 gallon aquarium with a tight fitting lid is recommended. A brackish environment is suggested, created by adding 2 to 3 teaspoons of salt to each two gallons of water. Provide good filtration and they will require a heater. A powerhead to create water movement is optional as these fish adapt well to many environments. The Desert Pupfish will swim in the middle and lower parts of your aquarium. These fish will appreciate a soft substrate for them to dig in to and hide. Fine gravel substrate along with some reed type plants will simulate their natural environment. Moderate to low lighting will make the fish feel most at home. Because they come from such changing environments there are many options on setting up for tank. Breeding Temperature: - These Pupfish breed Febuary to October when temperatures exceed 68° F.
Water Region: Middle - The Desert Pupfish will swim in the middle and lower parts of your aquarium. Desert Pupfish will do best in either a species tank or a community tank with other Pupfish of this same genera, Cyprinodon, or with Splitfins of the Empetrichthys genera. The females and young will school. The males are primarily loners, in the wild they will dig a shallow depression to rest in and chase all intruders away especially when in breeding mode. Same species - conspecifics: Sometimes - Males are very territorial. Slow Swimmers & Eaters (): Monitor - The pupfish tends to nip at fins. Shrimps, Crabs, Snails: May be aggressive - Snails are part of their diet. Males become an iridescent blue when in breeding mode and are larger than the females. In the wild Desert Pupfish will breed from February through October, whenever the temperature exceeds 68° F (20° C). The male becomes brightly colored and adamantly defends his territory from all but a receptive female. After a short courtship ritual the female lays one egg on the bottom substrate, the egg adheres to the substrate and the male will then fertilize it. Over the course of season, the female may lay hundreds of eggs, but each singly. These fish are easily bred in a small tank. Provide water with salt added and include a good amount of spawning mop to protect the eggs. After keeping the male and female separate for several days, introduce them into the breeding tank together. Courtship will start in about an hour or so with a vigorous courtship followed by a spawn. Once the courtship has ended the parents will eat the eggs, so they must be removed promptly. The eggs will hatch in 6 to 10 days. The larvae will start to feet the day after they hatch. The newly hatched fry should be fed infusoria, a liquid fry food, or newly hatched baby brine. The fry are easy to raise and will reach full maturity within 2 to 3 months. 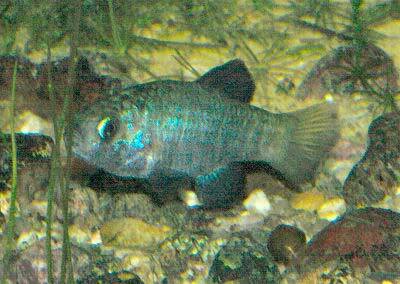 Desert Pupfish are extremely hardy and disease is not usually a problem in a well maintained aquarium. These fish however are very prone to Velvet disease. That being said there is no guarantee that you won't have to deal with health problems or disease. They are primarily susceptible to velvet and bacterial infections if good water quality is not maintained. Anything you add to your tank can bring disease to your tank. Not only other fish but plants, substrate, and decorations can harbor bacteria. Take great care and make sure to properly clean or quaranteen anything that you add to an established tank so not to upset the balance. A good thing about Desert Pupfish is that due to their resilience, an outbreak of disease can often be limited to just one or a few fishes if you deal with it at an early stage. When keeping more sensitive types of fish, it is common for all fishes to be infected even before the first warning signs can be noticed. The best way to proactively prevent disease is to give your Desert Pupfish the proper environment and give them a well balanced diet. The closer to their natural habitat the less stress the fish will have, making them healthier and happy. A stressed fish is more likely to acquire disease. Desert Pupfish are very resiliant. Yet it is recommended to read up on the common tank diseases. Knowing the signs and catching and treating them early makes a huge difference. For information about freshwater fish diseases and illnesses, see Aquarium Fish Diseases and Treatments. As they are endangered, they are not readily available. Check with local authorities about collecting or keeping these fish in your area before obtaining them. I raised pupfish while at university. They are relatively easy to spawn but time consuming. They have great personalities and make for hours of entertainment. I wish they were available for purchase. Does anybody know how to get ahold of these wonderful fish? As they are listed in California, and on the Federal level, as endangered, I'm not sure you can get them in any retail establishement. Your best bet would be to contact the fish and game department to find out if you can get a license or permit to collect them yourself or perhaps obtain some from a university. Am I wrong in thinking that if there was ever a fish that could thrive in the Aquarium trade, this is it? They are superior in their resilience and adaptability. They could very easily thrive in just about any type of aquarium setting. They'd make a perfect "starter fish" because they could tolerate the changing conditions and rough water chemistry of a new (uncycled) aquarium... And they are really good looking fish with loads of personality. Has anyone tried to raise some of them in captivity to see if we can get them off of the endangered species list and into the aquarium trade?